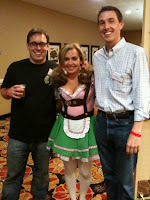 Emily and I went to the 26th Annual Dixie Cup, one of the nation’s oldest homebrewing competitions, on Friday night. Local homebrewers have been congregating at this event to talk shop and quaff each others’ ales since 1983, when their craft was legalized in Texas. While I am fan of craft beer, I have never actually brewed anything (other than trouble). Nevertheless, I thought it would be educational to attend, tasting the local flavor. As it turns out, the Dixie Cup was a cheap date (for me)—and time well spent for both us. To provide some history here, Emily and I officially entered the craft beer world together via a visit to Saint Arnold Brewing Company in July, 2007, and then again on our honeymoon in June, 2008, when we visited several breweries in and around Portland, Oregon (aka, Beer Town); we have been refining our pallettes for independently brewed beer since then. We arrived to the Dixie Cup early and overdressed, not knowing what to expect. We encountered a potluck dinner for which we were ill-equipped. No matter. Accompanying the homemade food was a line of tapped kegs from selected state breweries, commercial and otherwise. Taking in the scene, we immediately met two guys with an idea—and the entrepreneurship qualities that just might lead them to filling an apparent void, relative to the rest of the country, in Texas craft brewing. Jeffrey Stuffings and Michael Steffing—despite the subtle difference in surnames—are brothers and business partners. They are following Jeffrey’s dream to transition from homebrewer to pro brewer. I sampled their product, and it is excellent. The Das WUNDERKIND! was surprisingly hoppy, which I prefer. I also liked one of their others, the Rex Machina, as it was both sessionable and smooth, especially following the chocolate brownie I had noshed just minutes before. Jeffrey, a graduate of Notre Dame, is a longtime homebrewer who has lived in Austin for a couple of years. He is acting on his dream now, recently dropping his job as an attorney to pursue this endeavor full time, while Michael moved to town three months ago to help him realize it. As taken from its website, the company's founding description reads…. “In Medieval Times members of the Royal Court shared ancestry with—or owed political favor to—the King. The Court Jester was exceptional to this Noble Order. A blacksmith too reflective for life over the anvil or a farmer whose wit exceeded his ability to sow the fields, the Jester was plucked from the Masses to amuse the Court. Access and Privilege afforded the Jester unique Freedom to cast satire without fear of reprisal; his antics were, after all, merely in jest. Creativity, Guile and Cunning set this Wise Fool apart from the Noble Order. At this time, roughly 5% percent of the company remains available for purchase. To investors with interest, stake your claim while remaining shares are available. For further information on the opportunity and access to their executive summary, click here. 1. Their opportunistic foresight. They are part of a movement supporting locally made products, that has swept the country and is arriving to Texas. Jester King is in pole position to benefit from such growth, capitalizing on successes already reached by other state breweries like Real Ale Brewing Company, of Blanco, and Saint Arnold, a company with a vision I have previously described. 2. Their plan to buck the system—with temperance. They will produce beers that are “extreme,” a term oft-used in craft beer brewing and made famous by Sam Calagione, owner of Dogfish Head. With that in mind, after chatting with them, Jeffrey and Michael seem to understand that, to be profitable in a state where beer education is not totally materialized, they will need a light lager or a style that resembles the beers that we Texans are accustomed to drinking. Here's to Jeffrey and Michael, and their irreverent approach to brewing. I commend their entrepreneurial spirit as well as the creativity and passion behind their beer. Let's raise a glass to the Jester as King… round the corner he comes. That sounds like a great event. I am always impressed by those who pull off doing what they love. Sessionable?! I love it. It sounds like a comment I may have heard back in Oregon in reference to some dude's home-grown that he cultivated in his closet under a pilfered sodium light from a local park. Something like, "Far out, man. I sampled these nugs just prior to the Floyd laser thingy at the planetarium. All I can say is, sessionable, definitely sessionable. We rolled back to the dorms in a haze and blazed the gravity bong with the junk. Epic session." Now that I have found you, Chad. I'll be in here more often. Keep up the good posts. @Mike... keep coming, my man. Excellent use of "sessionable." Referencing OR, Full Sail, if you're not already aware, puts out a nice lager, Session, similar to Saint Arnold's Lawnmower... and available in TX. I like Beer Advocate's definition of "session beers" http://beeradvocate.com/articles/653. Bring on more craft beer in Texas!